?Deck Chronometer? A. Lange & Söhne, Glashütte/Sa., No. 202902. Made circa 1942. Fine, keyless, nickel deck and pocket lever chronometer with power reserve indication and special balance. Made for the Kriegsmarine Observation Service, No. M11428. C. Four-body, "bassine,? polished, back cover engraved with the Observation Service number. Hinged stainless steel cuvette. D. Brushed, silvered with painted black ?Dauphine? numerals, outer minute track, subsidiary seconds at 3, power reserve indication at 9. Blued steel ?spade? hands. M. 21''' caliber 48, frosted gilt, three-quarter plate, 17-jewels, straight line lever escapement with lateral banking extension on the entry pallet, Guillaume balance, blued steel Breguet balance spring with patent stud fastening, swan-neck micrometer adjustment to the regulator. Case, cuvette and movement signed. Diam. 60 mm. 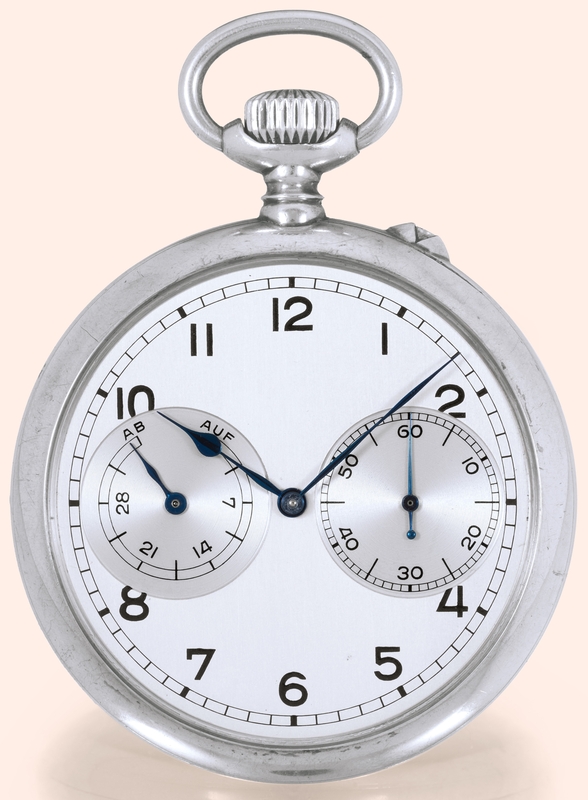 C. Four-body, "bassine, polished, back cover engraved with the Observation Service number. Hinged stainless steel cuvette. D. Brushed, silvered with painted black Dauphine numerals, outer minute track, subsidiary seconds at 3, power reserve indication at 9. Blued steel spade hands.